A discreetly placed icon in Saint Mary’s Church, Listowel, Co Kerry, recalls the Holocaust and the role of a Listowel-born Jesuit priest, Father Michael Morrison was the chaplain with the British and Canadian troops who liberated the Bergen-Belsen concentration camp in 1945. The wooden icon of the Virgin Mary and the Christ Child is said to have been carved by a concentration camp prisoner during World War II. It was presented to Saint Mary’s Church by the Donal Walsh Live Life Foundation on World Holocaust Day this year [28 January 2018]. The Revd Lieutenant Michael Morrison, SJ (1908-1973), was the liberating chaplain at the Bergen-Belsen concentration camp in 1945, and was the great-uncle of Donal Walsh from Blennerville, who before his death from cancer at the age of 16, had campaigned to help young people struggling with suicidal thoughts. Father Michael Morrison was born in Listowel in October 1908. He was educated in Limerick by the Christian Brothers at Sexton Street, and from the age of 14 by the Jesuits at Mungret College. At Mungret, he was an excellent student and sportsman, winning the O’Mara cup with his hurling team. At 18, he decided to become a Jesuit and he entered the novitiate in 1925. As part of his training, he was sent to the Jesuit-run school, Belvedere College, in Dublin to teach Math and Religious Knowledge and to live in the Jesuit Community. When he was ordained in 1939, he continued to teach in Belvedere College. He was teaching there in 1941 when the British army called on Irish priests to serve as chaplains in World War II. Morrison answered the call, and in 1941 he joined the 2/5th Battalion of the Welsh Regiment. His first posting was in the Middle East, where he worked with soldiers no matter what their religious affiliation was. In 1943 Morrison was sent to the No13 General Hospital of the Middle Eastern Forces, and in 1944 he was transferred to to the 2/8th Lancashire Fusiliers, Derry Regiment. In the closing days of the war, British and Canadian troops entered Bergen-Belsen on 15 April 1945. It was the first concentration camp liberated on the Western Front, and the soldiers had little idea of what they would face as they entered. When Morrison arrived at Belsen, he was confronted with the sight of ‘between 10,000 and 15,000 corpses lying about unburied.’ In his first letter home, he writes about the total desperation of the situation: ‘The CO expects 5,000 to die in the next two weeks. After that he expects the death rate to go down.’ But he admitted later on that this estimate was much smaller than the number who actually died. Unlike Auschwitz and other camps, Belsen had no gas chambers. It was originally used as a prisoner-of-war camp for French and Belgian captives. From 1943, Jews with foreign passports were kept there to be exchanged for German nationals imprisoned abroad, but very few exchanges were made. About 200 Jews were allowed to emigrate to Palestine and about 1,500 Hungarian Jews were allowed to emigrate to Switzerland. In time, Belsen became a holding camp for the Jewish prisoners. It was divided into eight sections, including a detention camp, two women’s camps, a special camp, a neutrals camps, a ‘star’ camp for mainly Dutch prisoners who wore a Star of David on their clothing instead of the camp uniform, a Hungarian camp and a tent camp. Bergen-Belsen was designed to hold 10,000 prisoners, but by the time Morrison arrived with the British and Canadian troops at the end of the war, there were more than 60,000 prisoners, including large numbers who had been moved there from Auschwitz and other camps to the East. Tens of thousands of prisoners from other camps came to Bergen-Belsen after agonising death marches, and the main causes of death were malnutrition and typhus. More than 50,000 people died at the camp between 1941 and 1945, including Anne Frank, the young Jewish diarist, who died just three weeks before the camp was liberated. Morrison was placed in Camp No 1, ‘Horror Camp,’ where the number of dead was so great that the army had to use bulldozers to push the mounds of dead bodies into large pits that became mass graves. Morrison would stand over these pits, staring at the rotting corpses and praying for the dead. They included Poles, Hungarians, Russians, French, Belgians and Dutch. Photographs show Morrison and a British army Jewish chaplain, Rabbi Leslie Hardman (1913-2008), conducting a joint service over Mass Grave number 2 at Belsen before it was filled in on 25 April 1945. Morrison found seven fellow Jesuits who had been held in Belsen because of their ethnic origins or political views. Five of these Jesuits died in the first few weeks. Near the end of 1945, the remaining 11,000 Jews where moved out of ‘Horror Camp’ to better conditions and on a day which Morrison describes as ‘White Monday,’ the camp was burned to the ground. After World War II, Morrison moved to Australia, where he taught at Riverview College and served as parish priest at Saint Ignatius Church. He later returned to Dublin to teach maths at Belvedere College. But he spoke little of what he had seen in Belsen. His health was failing, and he collapsed while walking up the steps in Belvedere House. He died in Jervis Street Hospital soon after on 7 April 1973. Father Michael Morrison was buried in Glasnevin Cemetery, Dublin. During the bank holiday week, I visited three towns in this group of parishes, Ballybunion, Listowel and Foynes that once had Church of Ireland churches. The churches in the two towns in Co Kerry still belong to the parish, but the church in Ballybunion now serves as a library and the church in Listowel is a theatre and arts centre. The former Church of Ireland parish church, Saint John’s Church, dominates the town’s main square in Listowel. But close-by, on one side of the square, is the equally interesting Roman Catholic parish church, Saint Mary’s Church. Saint Mary’s has been rebuilt on many occasions, but the church as it stands today is a Gothic Revival church that is mainly the work of the architectural partnerships of Pugin and Ashlin and then Ashlin and Coleman. I had been writing last week about Pugin’s son-in-law George Coppinger Ashlin (1837-1921), and Saint George’s, the house he built in Killiney which is now on the market. So, it added to my interests when I visited Saint Mary’s Church for the first time on Sunday afternoon [6 May 2018]. An old cabin on Tay Lane served as the Penal-era Catholic chapel in Listowel. Rentals for this chapel survive for the period from 1776 to 17823, and those from 1778 indicate that this mass house was rent free. A letter to Rome dated 1797 may indicate that by then a new church had been built. The parish registers date from 1802 (baptisms) and 1805 (marriages), and early 19th century maps show there was a Catholic church in the Square on the site of the present church by 1810. The first church was dedicated to the ‘Sanctae Crucis of Listowel,’ or the Church of the Holy Cross. Saint John’s, a new Church of Ireland parish church, was built in the Square around 1814. 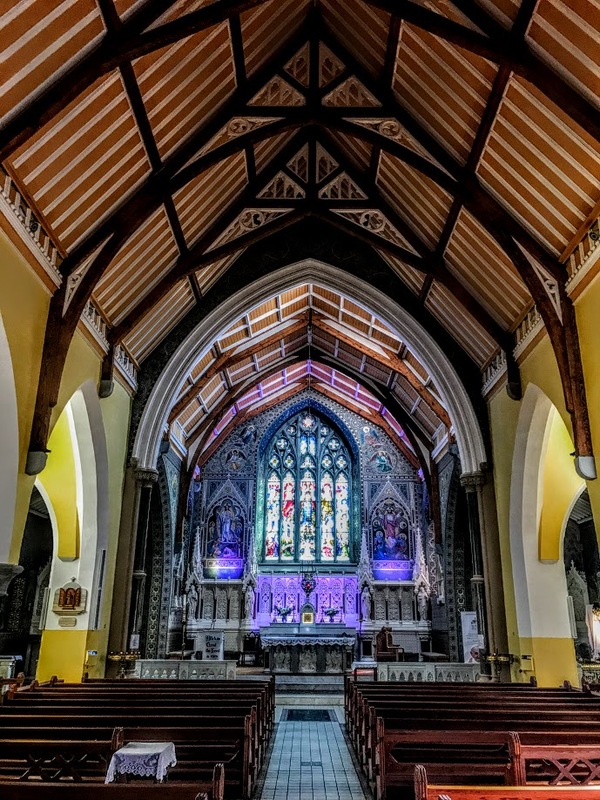 A decade later, the years immediately before the legislation introducing Catholic Emancipation, a new Catholic parish church was built in 1826-1829 on a site donated by the local landlord, William Hare (1751-1837), who had become the first Earl of Listowel in 1816. Local figures who offered financial assistance included Lord Listowel’s eldest son and heir, Richard Lysaght Hare (1773-1827), who was known as Lord Ennismore. The church survived for 40 years. But it was too small, and a meeting in 1865 decided to rebuild the church. Essentially this amounted to building a new church. Financial support was offered by Sir John Benn Walsh, 2nd Baronet and MP for Radnorshire, and George Sandes. Walsh was a Conservative politician with large estates in Berkshire, England, and in Radnorshire, Scotland, but had also inherited considerable estates in Co Kerry and Co Cork, as well as India. Shortly after Saint Mary’s Church was built or rebuilt, he was made a peer with the title of Lord Ormathwaite in 1868. Saint Mary’s Church, as we see it in Listowel today, was designed by Pugin and Ashlin in 1865-1866, when the building contractor was James Scanlan of Elgin Road, Dublin, and by Ashlin and Coleman, who returned to Listowel in 1907-1911 and again in 1921. Saint Mary’s is a cruciform-plan, double-height, Gothic Revival church. 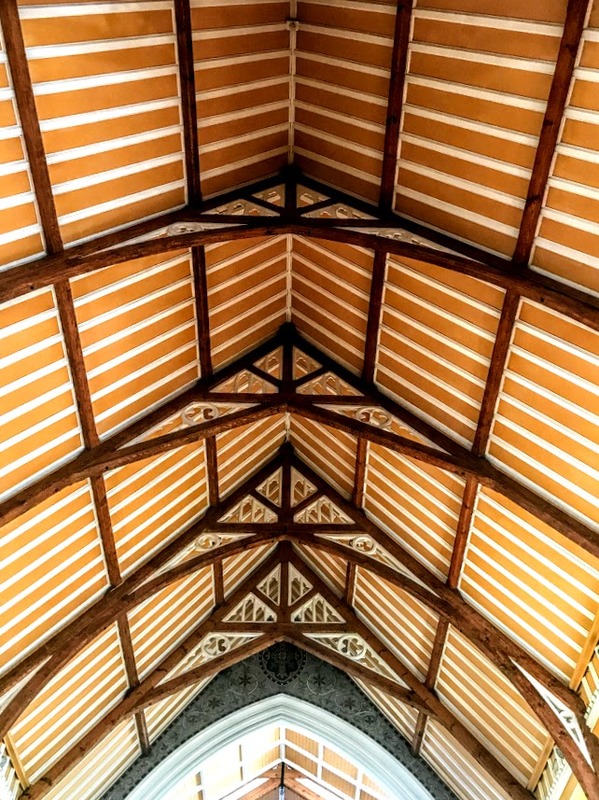 The church has a six-bay, double-height nave, six-bay, single-storey lean-to aisles, single-bay double-height transepts, single-bay, single-storey lean-to projecting porches, single-bay, single-storey flat-roofed chapels at each gable end, a single-bay double-height lower polygonal apse at the liturgical east end (south gable end), an entrance bay at the liturgical west end (north gable end), a single-bay double-height chapel at the geographical north-west corner with a polygonal west elevation, and a single-bay, three-stage tower. The nave roof is of pitched slate, while the aisle roofs are of slate roof, with ashlar copings and finials. There is a hexagonal spire on the tower with lucarnes. Local lore says Lord Listowel prevailed upon the clergy to ring the Angelus bell at 7 p.m. so that he could get an extra hour’s work from his workers. The wrought iron cross was designed by Ashlin and is the work of Hodges & Son of Westmoreland Street, Dublin. The walls are built with rock-hewn, snecked limestone that was quarried in Kenmare, and these walls have smooth finished dressings. There is stone tracery in the pointed windows and rose windows, with limestone surrounds and hood mouldings. Single lancets to tower. There is a cinquefoil window on the façade of the entrance. There are stepped ashlar reveals at the doorways with hood mouldings. The main entrance is flanked by pink marble pilasters. Inside, the roof has exposed trusses. The aisles have pointed arcades with polished black limestone columns, the floor is of black and red quarry tiles, timber moulded wainscoting, and a marble and mosaic gallery. The large bell was the work of Murphy of Dublin. The organ was designed Messrs White of York Street, Dublin. 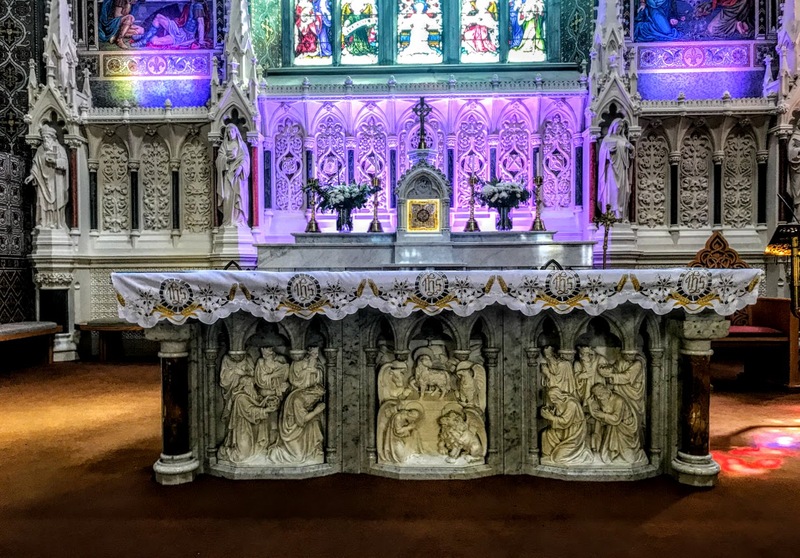 Ashlin and Coleman, the successors of Pugin and Ashlin, returned to Listowel in 1907-1911 to design the new chancel, side chapels and aisles, built by Sisk. Canon Thomas Davis, who was then the parish priest of Listowel (1882-1911), is buried at the top of the nave in front of the high altar, with a large inscribed slab covering his grave. Ashlin and Coleman returned to Listowel once again in 1921 to work with Sisk on the side aisles. 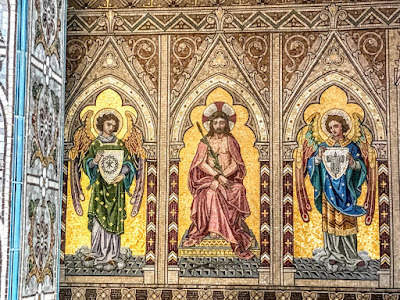 The sanctuary or chancel and the side chapels in this church have the most exquisite mosaic-tiled walls, which are the work of the firm of Ludwig Oppenheimer, mosaic artists based in Old Trafford, Manchester. This firm designed mosaic decorations for many buildings in Ireland from the 1890s until the 1960s. Almost all this work was in churches, but much of it was swept away during the liturgical changes ushered in with Vatican II in 1962-1965. There was a close working relationship with Ashlin & Coleman while Ashlin was alive, and Oppenheimers also worked closely with Earley & Co. The founder of the firm, Ludwig Oppenheimer (1830-1900), was born into an Orthodox Jewish merchant banking family in Brunswick, Germany. He was sent to Manchester to improve his English, and there he fell in love with Susan McCulloch, the niece of the Scottish couple with whom he took lodgings, and he converted to Christianity. As a result, he was cut off by his parents and became an apprentice mosaicist in Venice, returning to Manchester to marry Susan and to establish a mosaics business in 1865. By 1881, Ludwig Oppenheimer was employing 13 men and 15 women. 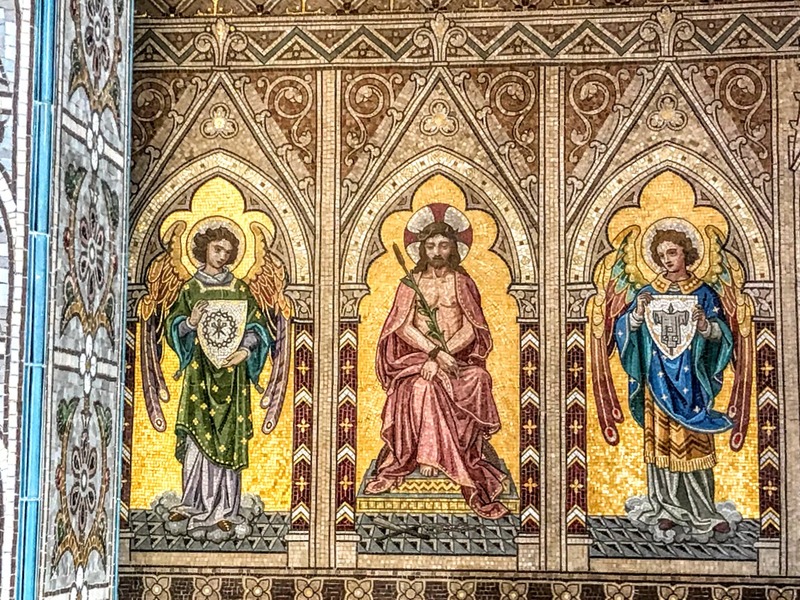 Of his six sons, four – Lehmann, Louis, Albert and William – worked for the family firm, while a fifth son, Charles, became a painter and also contributed designs for their mosaics. The eldest son, Lehmann James Oppenheimer (1868-1916), went to art school and won a scholarship for a year’s study in Florence. On his return, he married a fellow student, Edith Newton, in 1892. Their two fathers were not on speaking terms as Ludwig Oppenheimer despised Richard Newton as inefficient at business and a bankrupt, and Richard Newton disapproved of his daughter’s marriage to the son of a German Jew. Lehmann worked in his father’s firm from the time he was a boy and became the main designer in the studios. When his father died in 1900, he took over the firm and ran it with his brothers. Lehmann Oppenheimer also exhibited at the Royal Academy in 1906 and 1907. Lehmann and his younger brothers, Louis, Albert and William, all worked in the business. They travelled throughout Europe and Ireland seeking and gaining commissions including many prestigious projects. In Ireland, their main work was carried out in conjunction with the architect George Ashlin, who was AWN Pugin’s son-in-law. 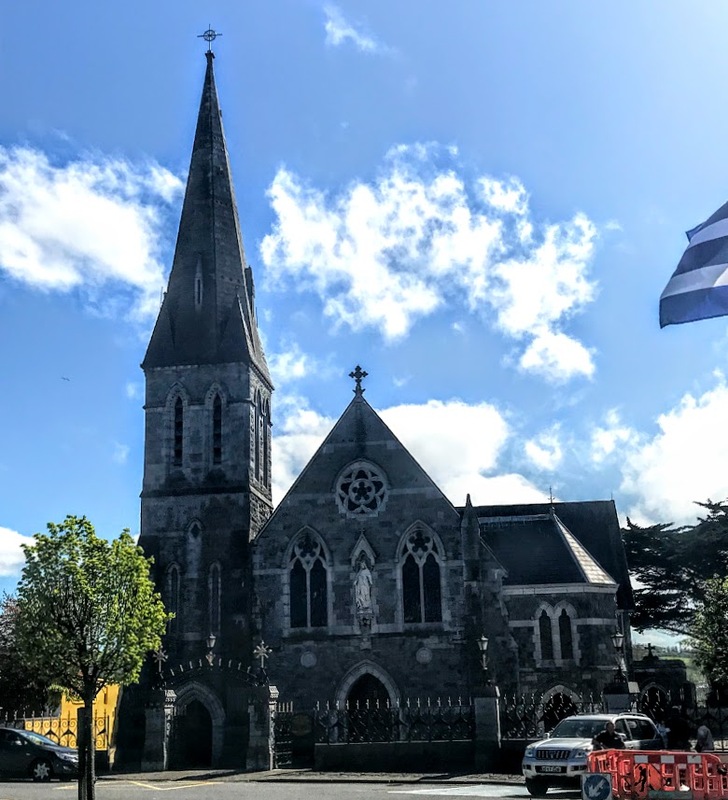 In 1859, Edward Welby Pugin received a commission to build the church of Saint Peter and Saint Paul in Cork and he made Ashlin his partner with responsibility for their work in Ireland, a position he retained until 1870. 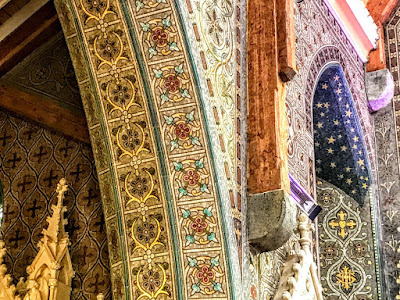 Their most important commission was Saint Colman’s Cathedral, Cobh Cathedral. After the partnership broke up in 1870, Ashlin practised on his own and many of the churches he built have mosaics by the Oppenheimers. 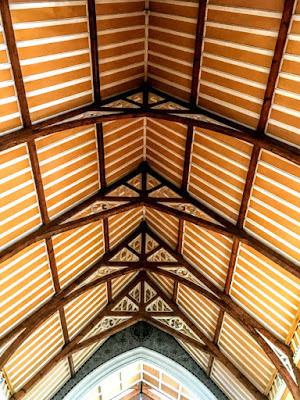 The culmination of the firm’s more than 40 years of work in Ireland is found in the Honan Chapel at University College Cork (1914). 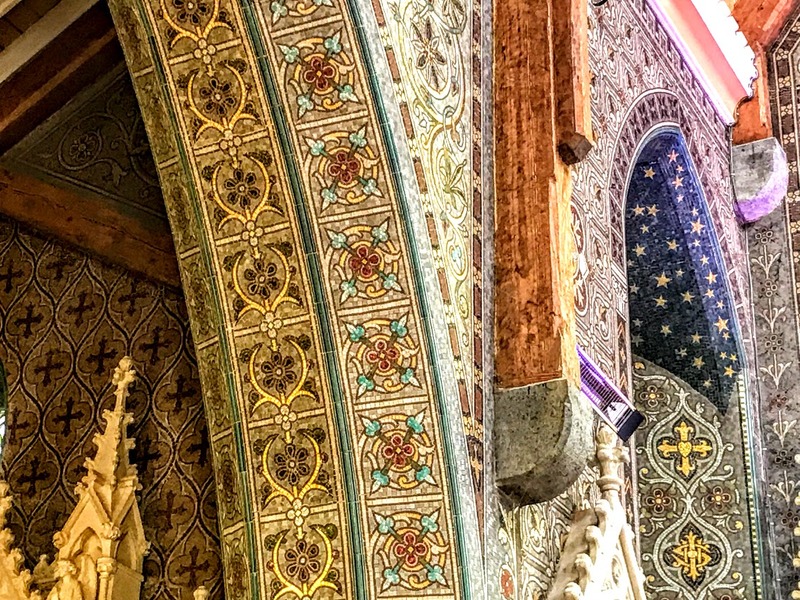 This chapel is a collection of works by the best figures in the Irish Arts and Crafts Movement, and includes mosaic floors and Stations of the Cross by the Oppenheimers. But they were the only non-Irish firm employed in a project that Sir John Robert O’Connell wanted to be by local firms using local materials. 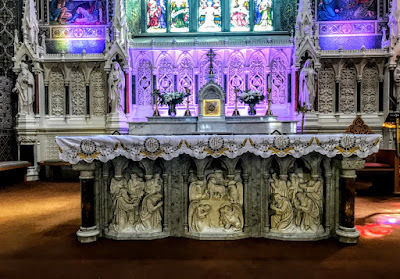 Their work on the Honan Chapel was never acknowledged by O’Connell, who was the administrator of the Honan family bequest and the prime mover of the design of the church. Other works by Oppenheimers in Ireland include the mosaic floors in the National Museum and the National Library in Dublin (1890s), and mosaics in Saint Mel’s Cathedral, Longford, Saint Patrick’s Cathedral (RC), Armagh, Saint Patrick and Saint Colman Cathedral, Newry, Saint Patrick’s Pro-Cathedral, Dundalk, Saint Mary’s Cathedral, Killarney, Saint Muiredach’s Cathedral, Ballina, the Lady Chapel in the chapel at Saint Patrick’s College, Maynooth, the Church of the Holy Name, Beechwood Avenue, Ranelagh, Saint Alphonsus Redemptorist Church, Limerick, the former convent chapel at Mary Immaculate College, Limerick, and Saint Joseph’s Church, Ballybunion. When World War broke out in 1914, Lehmann Oppenheimer and his family were on the Isle of Arran on a climbing and sketching holiday. Without passports and with a German name, they had difficulty in leaving the island. They arrived home to find that the mosaic factory had been stoned and the windows smashed. Lehmann’s son, Eric, decided to enlist; he was commissioned as a second lieutenant in the Manchester Regiment and fought at Paschendale and on the Somme. At 46, Lehmann was 11 years older than the age of enlistment and his wife, Edith (Newton), was a Quaker. But she told him he must follow his conscience and in 1915 he joined the Artist’s Rifles, and was commissioned a lieutenant. In 1916, he was gassed on Vimy Ridge. On receiving the news, his wife Edith and daughter Ethel crossed to France and nursed him during the week it took him to die. During this time, a cable arrived from his brother Louis seeking permission to sell the business. Lehmann was too exhausted to make a decision and indicated that Louis must decide what was best. Lehmann died as the result of gassing on 8 November 1916 at Cristol Military Hospital, Boulogne. On their arrival home, Edith and Ethel found that Louis had indeed sold the business – but for a very small amount to his brother Albert, Ludwig’s this son. This caused some bitterness as the firm was based on Lehmann’s gifts as a designer and felt his son Eric should have inherited a major portion. Lehmann’s son, Eric Newton, change his surname by deed poll to that of his mother’s family in 1918. He had been designing for the firm before he enlisted in the army and rejoined it in 1918. He returned to the family business, but while he was still preparing designs for the firm, he embarked on a career as an art historian and critic. In the early 1920s, he began to write art criticism and deputised for the regular critics on the Manchester Guardian. In 1930, he was appointed a regular critic. He left the family business in 1933, moved to London. In 1934 he married Stella Mary Pearce, a costume consultant at the National Gallery and he moved to London. His first book was published in 1935 and he pursued a career as an art historian, lecturer, writer and broadcaster as well as in painting and drawing. Another brother, Karl (Charles) Oppenheimer, followed Lehmann to art school and studied under Walter Crane at the Manchester College of Art. He also designed mosaics for the family firm, but painting became his career and he exhibited regularly at the Royal Academy and eventually moved to Kirkcudbright. His works can be found in many Galleries in Scotland, England and abroad. The Oppenheimer studios continued manufacturing mosaics in Manchester until 1965, when, a full century after its foundation, the firm eventually closed. Some of the windows in Saint Mary’s Church, Listowel, are by Mayer of Munich, as is the statute of the Virgin Mary on the façade of the church. The window above the high altar was donated by the women of the parish in 1908. Later work on Saint Mary’s was carried out by the architect James Rupert Edward Boyd Barrett, who designed additions and renovations in 1956. In line with the liturgical changes that followed Vatican II, much of the old altar was removed and the pulpit were removed. The church was renovated internally in 1998, including rewiring and repainting. A two-month renovation project was completed in August 2014, transforming the appearance of the church. This recent work included a new tiled floor, replacing the underfloor heating pipes, some electrical change and other additions. While Saint Mary’s Church was being redecorated, the parish used the former Saint John’s Church of Ireland parish church in the Square and Saint Michael’s College.